Meet our sophisticated diva of the week, Dr. Iqbal Al-Assaad. 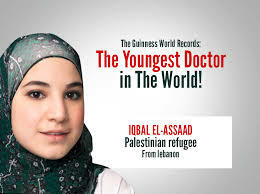 Dr. Al-Assaad is the Guinness Book of World Records youngest doctor at the tender age of 20. Born in Lebanon, Iqbal was labeled a child prodigy at age 9 when she skipped from 3rd to 9th grade. She then graduated high school at the age of 12 and with help from the government secured a scholarship to attend Cornell University Qatari Campus. While many would think that her age would bar her from many things, it is actually her status as a Palestinian Refugee. As a Palestinian Refugee, she is not allowed to practice as a doctor. It is national law to preserve certain jobs for Lebanese nationals such as medicine and law. Iqbal dreams to one day assist the Palestinian refugees who are in the camps with adequate medical care such as through a free medical clinic. Although there are medical facilities at these camps, it is not enough for serious cases that she hopes to tackle. After securing a scholarship from Qatar Foundation chairwoman Sheikha Mozah bint Nasser Al Missned (she was a previous Sophisticated Diva), Iqbal is currently completing her residency at the Children’s Hospital in Cleveland, Ohio. Go Iqbal! We hope that Lebanon would change their policies soon and not discriminate based on ethnicity.